The 1715 Fleet was a Spanish treasure fleet returning from the New World to Spain. In the evening of July 30, 1715, seven days after departing from Havana, Cuba, eleven of the twelve ships of this fleet were lost in a hurricane near present day Vero Beach, Florida. Because the fleet was carrying silver, it is also known as the 1715 Plate Fleet (plata being the Spanish word for silver plate). About 1,000 sailors perished while a small number survived on lifeboats. Many ships, including pirates, took part in the initial salvage. The shipwreck was originally discovered by Kip Wagner. Mel Fisher was subcontracted for the salvage. 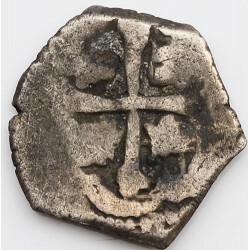 Authentic 2 Reales Cob From the 1715 Treasure Fleet Denomination: 2 Real..